Christians have worshipped on the site of Glasgow Cathedral for well over a millennium, from the days of St Mungo in the 7th Century. From this point onwards, music has been a part of worship, even though the Cathedral in its current form was only completed in the 12th century. As the political and religious landscape has changed over the years, so has the music. Beginning with monastic chants and then early polyphony sung by the Vicars Choral, at the time of the Reformation, music in the nascent Church of Scotland followed the liturgy away from Latin texts and into the vernacular, resulting in an enormously diverse repertoire. 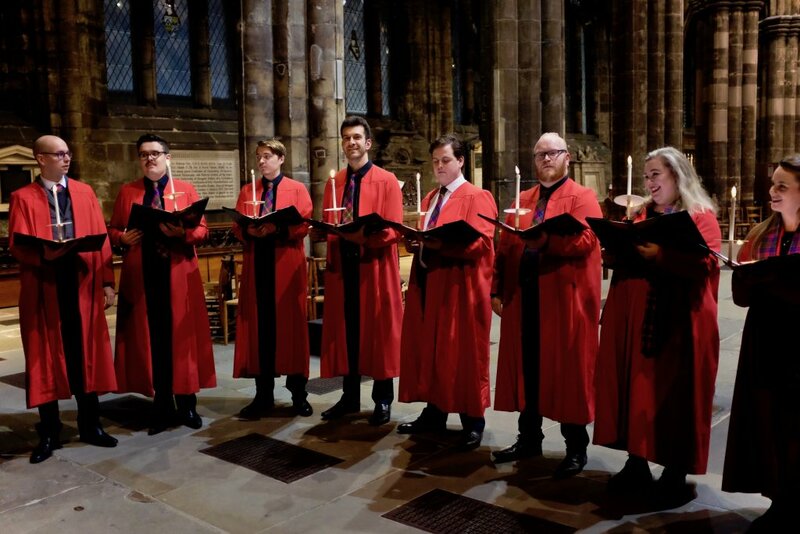 Glasgow Cathedral Choir is a professional ensemble with a repertoire covering the entire lifespan of the Cathedral, and sings at two services each Sunday: 11am Morning Worship and 4pm Choral Evensong. In addition to this they perform at many special services including weddings, funerals and other special events. The most recent of these were the visit of HM Queen Elizabeth II on her Diamond Jubilee, the Commonwealth Games service and the service to commemorate the beginning of the First World War, broadcast live by BBC Television. The first of the choir’s commercial recordings, ‘Christmas from Glasgow Cathedral’ is available here.